Holstein, Missouri; April 2000. From J. M. Fiegenbaum; all rights reserved. 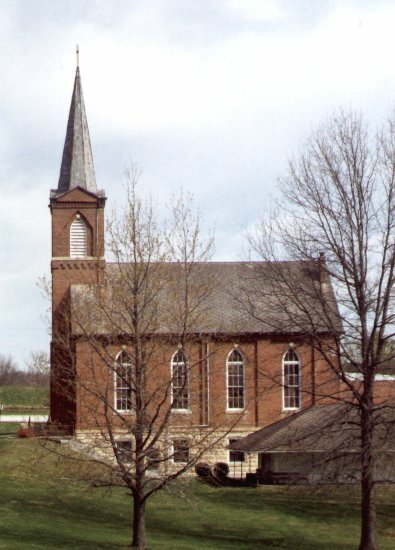 This brick church, the third building the congregation in Holstein has constructed, was dedicated on 28 October 1884. 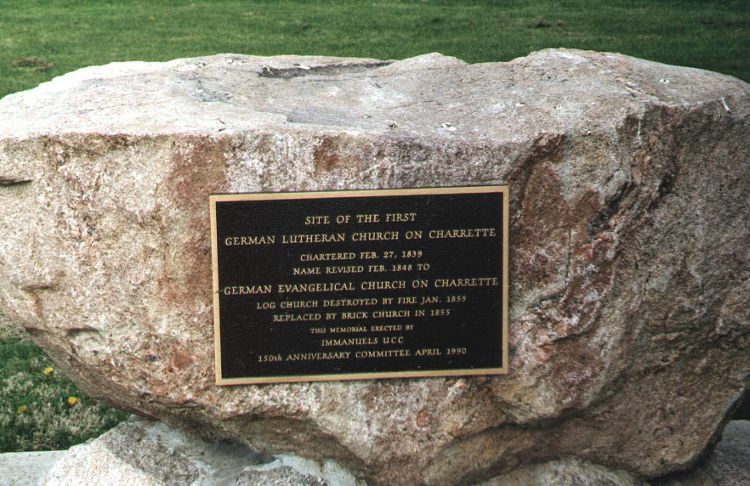 The large stone in the foreground of this picture, with a brass plaque, was erected across the street from the present church in April 1990 to commemorate the congregation's 150th anniversary. The stone stands on the former site of the first two church buildings and is surrounded by the oldest of the three cemeteries at Holstein. 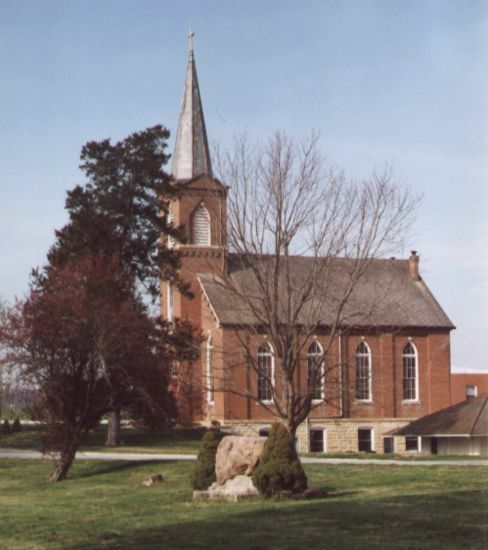 The first church in Holstein was the German Lutheran Church on Charrette, established in February 1839 (Charrette Creek runs southward through the area to the Missouri River, and gives this region of Warren County - the Charrette Hills - its name). Herman Garlichs, the pastor of the church at Femme Osage, St. Charles County, Missouri, served as the first minister at Holstein. He was a Reiseprediger or circuit minister, traveling regularly among the congregations under his charge. For several years he held services once a month at Holstein; on other Sundays, the services were led by local elders. A log building was raised in Holstein during the winter of 1839-1840. The first service in the new church was held on 2 February 1840 and a constitution was adopted. A new constitution was drafted in 1848 when the Holstein congregation joined the Evangelischer Kirchenverien des Westens. The church at Holstein changed its name to the German Evangelical Church on Charrette. A fire on 2 January 1855 destroyed the log church. By the end of November 1855 a new brick church building had been erected, at a cost of $1,593.43. In 1883, during the ministry of Rev. Andreas Johann Heinrich Bierbaum, plans were made to build an new and larger church building of brick and stone, with a full basement. The new building would stand across the street from the old church. At the annual church meeting in January 1884, the congregation changed its name to the German Evangelical Immanuels Church of Holstein. In October 1884, the new church building (shown above) was dedicated. Construction had cost $6,702.23. In 1934, following the merger of the Evangelical Synod of North America and the Reformed Church in the United States, the congregation at Holstein changed its name to Immanuels Evangelical and Reformed Church. In 1939, the congregation celebrated its 100th anniversary. In 1957, the Evangelical and Reformed Church and the Congregational Christian Church merged to form the United Church of Christ. The Holstein congregation adopted a new name to reflect this union, and became Immanuels United Church of Christ. Source: Immanuels United Church of Christ. Anniversary Book Committee. The History of Our Church, 1839-1989: One Hundred Fifty Years. Holstein, Missouri: Immanuels United Church of Christ, 1989. Holstein, Missouri; 2005. Permission of Byron H. Nolte; all rights reserved. The organ at the front of the sanctuary was dedicated in May 1909. It cost $1,440.00. 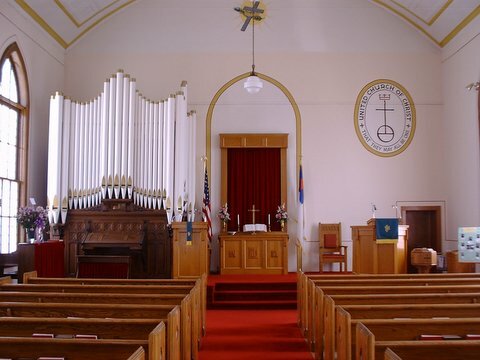 The Hinners Company allowed $100 in trade for the old organ, which had been installed in the balcony. Immanuels United Church of Church from the south. 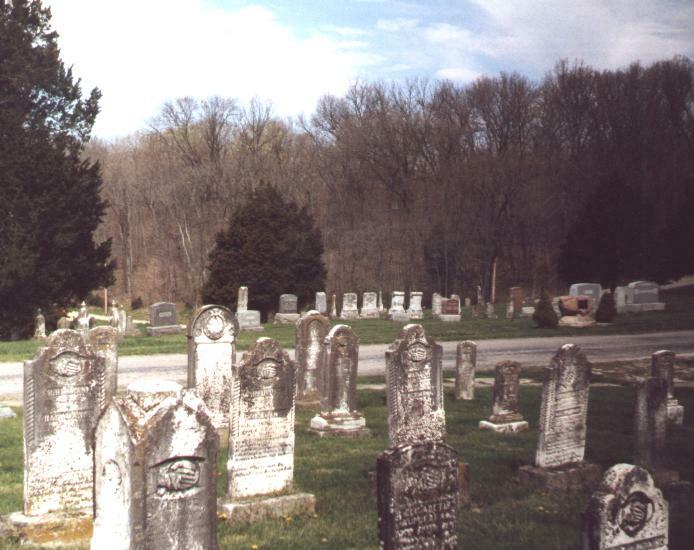 A view from the second cemetery, looking west and across Church Street to the oldest cemetery. The memorial stone and plaque are visible on the middle right side of this photo. There are three cemeteries associated with Immanuels Church. The oldest is on the site of the first two church buildings constructed in Holstein. It is south of the present-day parsonage and in the background of this photograph. The second cemetery is across Church Street from the oldest cemetery and south of the present-day church building. It is in the foreground of this photograph. The third cemtery, often referred to as the New Cemetery, is just north of the present-day church building. The land was purchased from the Dan Oberhellman farm and was dedicated in 1916. See also Jane Denny's photo of this memorial plaque. She has also shared photographs of the church, its cemeteries and selected grave markers on a web site at RootsWeb.